Sup yo. For those who don’t like my reviews of the Friends theme, here’s something completely different: a Creator set. It’s a tiny Creator set too. Generally I don’t have much interest in Creator sets, but I came across this one when trying to find a specific part for a model I was building. Rather than wait seventeen years for a BrickL… online seller to ship them to me, I did the best thing I could and bought this set. There aren’t many sets of this size around any more, and seeing it for the first time in the store took me back to the time before my “dark age”: when GBP 1.99 [boxed] sets could be found on the shelves at Toys ‘R Us, and GBP 100 LEGO sets were almost unheard of. The very first LEGO set I bought for myself was one of those smaller boxed ones. It’s somewhat hard to believe, but this is a 3-in-1 Creator set like its larger counterparts. One of the staff at the LEGO store had mentioned that people bought three of this set at a time to make all three models, which – as you can see in the inset picture – all join together to make a complete train. It also appears to be a popular set because of that, as there were none on the shelves. What could be the scale reference this time? Yes, one of the large wheels. So the part I was after was the 2x4x2/3 curved slope in Black (part 88930). This set is currently the least expensive source that’s still around, with your next cheapest option being The Joker Steam Roller from the DC Super Heroes theme. You’ve seen most of the other parts elsewhere, but of note is the 2×2 round brick in Dark Green, currently exclusive to this set. The 2×2 round plate in Dark Green first showed up in the first 2013 Holiday Set, and is also present in this year’s Treehouse Creator set. The Dark Green 1×4 plate is present in four other sets, but this is the cheapest you’ll find it in. 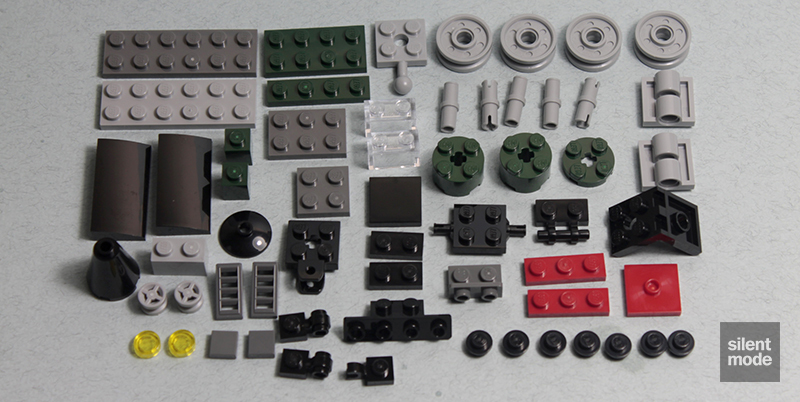 The headlining build of the train comes first, which uses most of the parts in this set. Like the name suggests it looks almost like a small version of the famous Emerald Night train – although I’m sure it’s no consolation to anyone still looking for that set. Of note is the clever use of the socket hinge plate on top of the train, as well as the way the cone was used for the train’s chimney. Indeed, only these four leftover parts are left from the build. They will all come in useful for your own builds, I’m sure. I’m at a loss to what this build is: could it be a souped-up fast version of the Emerald Express? Perhaps it’s a train designed to clear the tracks? Maybe it’s a missile carrier? I really don’t have a clue, perhaps someone who is into trains can clue me in. In any case, there are significantly more leftover parts to play around with. I’ll be taking those slopes now, thank you very much! No train in the world of LEGO would be complete without a passenger carriage or some kind of car for the train to pull… maybe a cargo train would be exempt from this universal rule, but generally trains pull things around. This one looks like it might be too small for passengers, but it works within the limits of this Creator set. The carriage is so small that it leaves by far the most leftover elements. With a little creativity one could even make another model from these leftovers. Creator sets aren’t my thing, especially if they don’t come with minifigures, and this set is no exception. I wasn’t particularly excited about it – probably because I’m not as much into trains as most other AFOLs – but that doesn’t make it a bad set. The strength of this set is that it’s 3-in-1. The Creator theme makes a great effort to reintroduce the concept of alternate builds, encouraging people to build their own models, and such a set at this price is a great thing. There’s also the clever ploy of having all three builds interact with each other, thereby encouraging people to buy three of the set to make the complete train. In terms of parts, there really isn’t enough of the interesting ones to warrant buying to part out, even if you’re after the Dark Green elements. Then again, what else can you do if the situation is tight? Of the parts in the set, there should be something for everybody anyway, whether it’s Dark Green, the pinless Transparent 1x2s or the Trans Yellow round tile, or something else. I’m giving this set 5.6/10: if you want it go get it, and if you don’t see it ask the staff if they have any more.